The Christmas season gives us many wonderful opportunities to tell Japanese why Jesus our Savior was born. Though Japanese are typically very resistant to Christianity, during the Christmas season they are often more willing to attend church. As you can see, God blessed us with many attending our various Christmas services this year. Pray for God to work in the hearts of those who attended. Pray that His Word will bear fruit and lead to their salvation. Will & Rebel Hill arrived in Nagaoka in August of 2015. Recently, they started two English classes as an outreach to Japanese here in Nagaoka and in the neighboring city of Niigata. God has blessed their efforts with a good number of people attending their classes. A number have also come to church as a result of this outreach. We thank the Lord for the Hills. Please pray for them as they continue studying Japanese. 1) Larger facilities & more parking space for Agape Bible Baptist Church. 2) A Japanese co-worker who will eventually become pastor of Agape Bible Baptist Church. 3) Believers at Agape to grow more fervent in our love for the Lord. Thank you for your prayers and support. 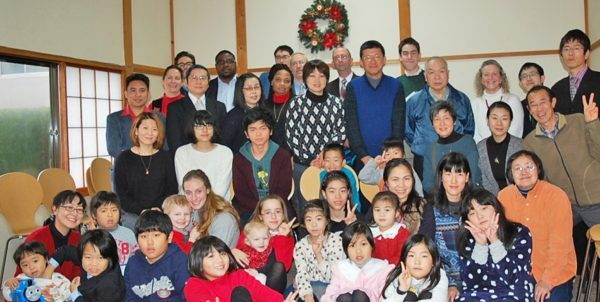 You are a real encouragement to us as we continue serving the Lord here in Japan. We pray God will bless and use you as you continue serving Him.